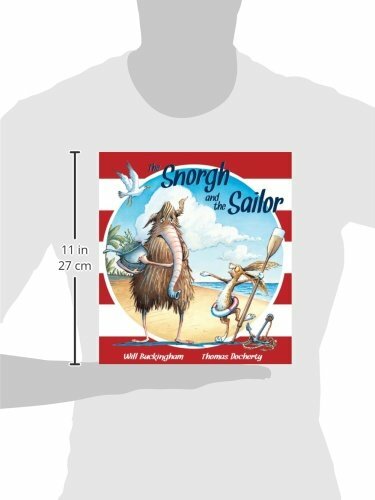 The Snorgh – his name encapsulates him - a strange hairy creature with an elephant-like trunk, stands clutching his bucket of samphire on the cover, skinny legs apart gazing out as the lively sailor hare persuades him there is another life beyond his shoreline home. The Snorgh is set in his ways: he doesn’t have visitors, he doesn’t share his soup, he goes to bed at eight. He thinks he’s happy with that, but his gloomy countenance shows otherwise. Then, routine is upset when the shipwrecked sailor barges his way into his home, repaying the Snorgh for his ‘hospitality’ with stories of the amazing whales and whirlwinds and sea monsters he has met on his voyages. This is a tale about difference and change – and one about the power of story too. Once change is precipitated it is impossible to go back to old ways, as the Snorgh discovers when the sailor leaves as suddenly as he has arrived, and without finishing a story. Docherty interprets Buckingham’s characters splendidly, creating a memorable addition to the characters that populate children’s books in the Snorgh, with his graceful arms and legs attached to a pear-shaped hairy body, lash-fringed eyes and grotesque facial appendage. The flat, windswept marsh landscape of the opening double spread as the Snorgh gathers samphire for his soup is in contrast to the giant waves, whirlwinds and monsters of the sea later encountered by the Snorgh, as in his bathtub boat, he sets out on his own adventure to find the sailor. Matt paper and invitingly designed layout also make this lively narrative a welcome newcomer. Entertainment for readers of all ages.